Most campgrounds in Jasper begin opening in mid-June, and all but Wapiti are closed by mid-October. All campsites have a picnic table and fire ring, with a fire permit costing $8 (includes firewood). A percentage of sites in the most popular campgrounds can be reserved through the Parks Canada Campground Reservation Service (877/737-3783, www.pccamping.gc.ca beginning in mid-January for the upcoming season. Jasper’s 10 campgrounds combine to handle all but the busiest summer nights. And on the rare occasion all campsites fill, campers are directed to overflow areas. These are glorified parking lots with no designated sites, but fees are reduced ($12 per unit). 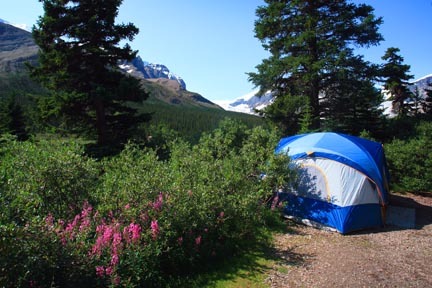 Whistlers Campground, at the base of Whistlers Road, three kilometers (1.9 miles) south of town, has 781 sites, making it the largest campground in the Canadian Rockies. It is divided into four sections; prices vary with the services available – walk-in sites $22.50, unserviced sites $27.40, powered sites $32.30, full hookups $38.20. Washrooms and streetlights are spread throughout, while each section has showers, playgrounds, and a nightly interpretive program. Whistlers is open May to mid-October. Two kilometers (1.2 miles) farther south along the Icefields Parkway is Wapiti Campground, which offers 366 sites and has showers; unserviced sites $27.40, powered sites $32.30. This is the park’s only campground open year-round, with serviced winter camping $21.50 per night. 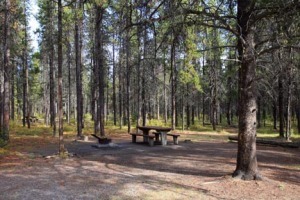 Sites at Wabasso Campground, along Highway 93A approximately 16 kilometers (10 miles) south of town, are set among stands of spruce and aspen; $21.50 per night. East of town, off Highway 16, are two smaller, more primitive campgrounds. 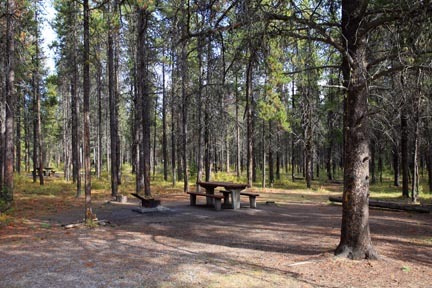 Snaring River Campground, 17 kilometers (11 miles) from Jasper on Celestine Lake Road, is $15.70 (overflow camping is $10.50); Pocahontas Campground, 45 kilometers (28 miles) northeast, is $21.50. Both are open mid-May to early September. Aside from Whistlers and Wapiti Campgrounds at the top end of the Icefields Parkway near the town of Jasper, there are five campgrounds along this stretch of highway. All sites fill on a first-come basis. Wilcox Creek and Columbia Icefield Campgrounds are within two kilometers (1.2 miles) of each other at the extreme southern end of the park, just over 100 kilometers (62 miles) south of the town of Jasper, and around 125 kilometers (78 miles) north of Lake Louise. Both are primitive facilities with pit toilets, cooking shelters, and fire rings; all sites are $16. Smallish sites at Columbia Icefield Campground are set in a stunted subalpine forest of aspen and spruce, with views extending across to the Athabasca Glacier. Immediately to the south, Wilcox Creek offers larger sites, better suited to RVs and trailers, but with no hookups. Jonas Creek, Honeymoon Lake, and Mount Kerkeslin Campgrounds are all within a 50-kilometer (31-mile) stretch continuing north. All cost $17 per night and have primitive facilities (no hookups or showers).